Our Super Valu Tattoo Outfit #6 comes with our DC power supply which will supply clean power to run any of our tattoo machines. This kit comes with two Supreme Quick Change machines. These machines feature 8 wrap coils with a rubber nippled armature bar, nickel plated 2 piece springs, heavily chrome plated investment casting frames with all stainless steel hardware, 10 MFD 35 volt capacitor, silver contact screw, and our patented (#D356,944) LeeverLoc Fastener Device. These two machines also come with our 2-piece stainless steel tube (the grip and tube are one piece – only the tip is soldered on). 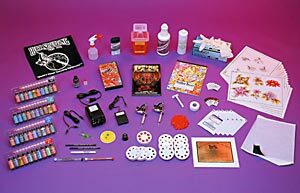 Included with this kit are the book Tattooing A to Z by Huck Spaulding and our instructional video The Art of Tattooing which will help you along the way.